Park Geun-hye is South Korea’s new President. The nation’s economy and foreign relations will provide early tests. Sworn into office on Monday, South Korea’s first female president, Park Geun-hye, has warned of a “global economic crisis” and the nuclear threat from neighboring North Korea. Can she match her late dictatorial father’s growth record and deliver the promised “People’s Happiness Era”? Bad slogans aside, the new leader of Asia’s fourth-biggest economy has her work cut out for her amid a faltering growth rate, widening income gap, record household debt, soaring welfare costs and a rising currency. Other concerns include North Korea’s provocations and worsening relations with other regional powerhouses such as Japan. In her inauguration speech outside Seoul’s national assembly building, Park urged Pyongyang to abandon its nuclear program and called on it to become “a responsible member of the international community”. “North Korea’s recent nuclear test is a challenge to the survival and future of the Korean people, and there should be no mistake that the biggest victim will be none other than North Korea itself,” she told an estimated crowd of 70,000. However, Park’s inauguration speech offered not only warnings, but also stirring rhetoric to her nation of 50 million people. The 61-year-old leader pledged to increase investment in science and technology, while empowering small business owners to compete with larger companies – perhaps implying tighter controls on the market power of the nation’s “chaebol” conglomerates, such as Hyundai and Samsung. As The Diplomat previously reported, South Korea spends the second least on welfare as a proportion of GDP among industrialized nations. Park promised during the election campaign to spend an estimated U.S. $125 billion on education, childcare and medical treatment, and her speech noted the need for “tailored welfare” as well as a “merit-based” education system. Park has taken office with a large amount of goodwill, with the latest survey by Realmeter giving her a 61 percent approval rating and many older Koreans nostalgic for the double-digit growth achieved in the latter period of her father Park Chung-hee’s. The South Korean economy expanded 1.5 percent in the last quarter, but is forecast by the Bank of Korea to reach 2.8 percent this year and in 2014 – still below its speed achieved prior to the global financial crisis. Park has also vowed to tackle inequality by increasing the proportion of women in management roles as well as tripling child-support subsidies for single parents, countering the OECD’s widest gender income gap. However, economists warned against unfunded pledges adding to the nation’s fiscal burden. “The current economic climate doesn’t allow for front-loading the budget to fund new welfare and employment programs,” Jeon Young Jae, research fellow at the Samsung Economic Research Institute, told Bloomberg News. U.S. investment bank Goldman Sachs has previously urged the government to boost social spending, given the risk to the economy posed by U.S. $873 billion in household debt. According to Korean daily The Chosun Ilbo, upward social mobility “is becoming an ever more distant dream for the poorer classes,” with a diminishing proportion of lower-income households escaping poverty. The meeting was aimed at improving ties following the February 12th North Korean nuclear test. Relations between the two have been strained in recent months over the disputed islands known as Dokdo in South Korea and called the Takeshima Islands by Japan. The row flared last Friday when Seoul officially protested Tokyo’s decision to send a senior official to a commemoration ceremony for the islands’ incorporation into Japan, with Korean business groups threatening a boycott of Japanese goods in response. Some Korean media outlets have urged the president to increase dialogue with Beijing and not allow a more hawkish Japan to derail North Korean nuclear talks. The world might have changed since Park’s father seized power in a military coup in 1961, but the Korean Peninsula technically remains at war and South Korea’s economic miracle has recently faltered. Delivering another miracle while avoiding a foreign policy crisis will prove challenging, but for a leader who lost both parents to assassins it should not seem insurmountable. 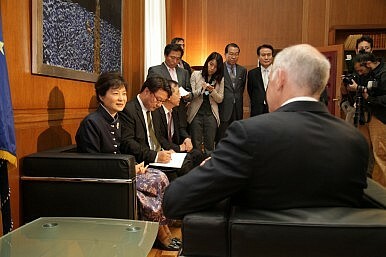 Park enters office in South Korea facing a daunting array of domestic and foreign policy challenges. She may very well prove up to the task.